Ubuntu provides a built-in Power utility which allows to choose your laptop behavior when the lid is closed. However, there are only “Suspend” and “Do nothing” available out-of-the-box. 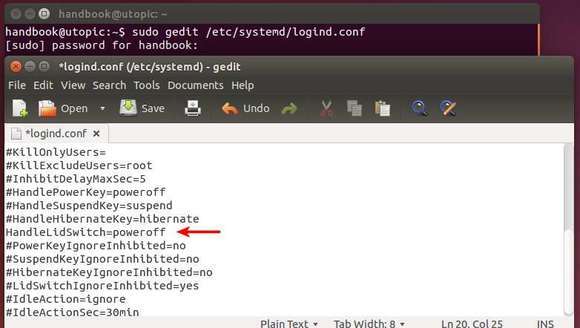 What if you want to shutdown or hibernate Ubuntu automatically when laptop lid is closed? Replace gedit with vi or nano if you’re on Ubuntu server without a graphical user interface. Type in user password when it asks. Note that there will be no visual feed back when type in a password. HandleLidSwitch=poweroff – power off when lid is closed. 3. After saved the changes, restart the computer so it takes place in next boot.